This summer, I had the great pleasure of touring with Nomadic Massive. Based in Montreal, they are an amazing multilingual hip hop group. We recently completed tours across Canada and France, and this was the highlight. Iqaluit is one of the most interesting places I've ever been. I've travelled to many wonderful places, but nowhere as real. Iqaluit throws life in your face with its contrasting qualities. I was deeply impacted by the intensely beautiful territory of Nunavut. Iqaluit is the most northern capital in North America. With a population just under 7,800, it is the largest town in Nunavut. Many people from other northern communities come to live here. We met people from as far away as Resolute. Many immigrants who come to Canada end up here because of job opportunities. Everyone we talked to had a unique story and experience of living there. As we flew into Iqaluit, I was struck by the true isolation of the region. 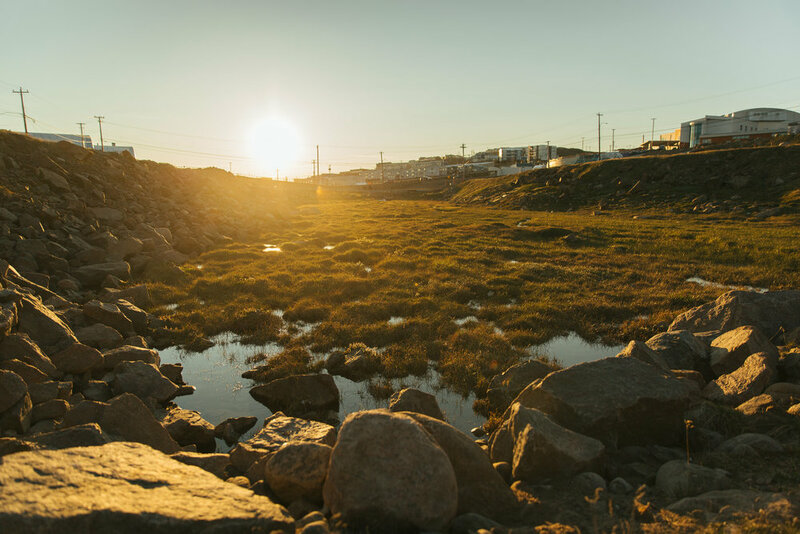 Iqaluit is surrounded by thousands of kilometers of rock, small lakes, and ocean. Most goods are flown or shipped in, which drives up the cost of living dramatically. The photos from our three days are presented in order of time to portray the endless summer days. Dusk would begin around 10:45 PM, and the sun would never fully set. The sunrise would start around 1:45 AM. Keep in mind, the winter is the complete opposite, and the windchill can reach -60 degrees celsius. 4:13 PM - The most northerly Tim Hortons in the world. This man was at the top of the mountain with his granddaughter. He has lived in Iqaluit for 10 years. I asked what has changed the most since he has lived there. He said there are a lot more houses and a lot of bootlegging. There are no liquor stores in Iqaluit, the locals have to go to one of the few places in town that serves alcohol or they ship in their own. A common theme I found when talking to local indigenous people was that they are most comfortable in this environment. Whenever they leave to work in a city such as Ottawa, they feel claustrophobic with the buildings and trees. They are used to an environment where they can see forever. Many eventually return to the north. There are four official languages in Nunavut: Inuktitut, English, French, and Inuinnaqtun. The first three can be seen on stop signs. You hear Québécois French sometimes, as people come up and live here for jobs. Locals speak the South Baffin dialect of Inuktitut, which is passed down orally from elders. The language sounds like nothing I have ever heard before. The written language is based on the Cree syllabary created by Methodist missionary James Evans. It wasn't fully adopted until the 1970's by the Inuit Cultural Institute. 2:21 AM - The Snack is the only 24 hour food spot in town. Their little red delivery cars would be zipping around town along with the taxi drivers all night. We had a late night hang with people from the Alianait Arts Festival. We jammed with musicians from around Nunavut and Greenland. Jean-Michel started playing "The World Is Yours" by Nas on the piano, and everyone joined in with their own parts. Hip hop reaches far! We experienced endless generosity and friendship in Iqaluit. Spending time here was deeply humbling. I hope to return soon. I recently had the opportunity to photograph this amazing show for John Hollenbeck. His project called Claudia Quintet, consists of Chris Speed on tenor sax and clarinet, Red Wierenga on accordion, Matt Moran on vibraphone, Drew Gress on bass, and of course John Hollenbeck on drums. They have played together in this formation for 18 years, which is evident in the cohesiveness of their sound. Everyone is a unique and expressive improvisor, yet their individual voices make this music come alive. Chris Speed is easily one of my favorite musicians. He has so much honesty, fire, and sensitivity in his playing. I photographed his band Endangered Blood back in June, which was one of the best shows I have seen all year. His sound is never overly loud, but is always full and present. He plays on some recordings that are very influential for me, including some work with Jim Black and Human Feel. Hollenbeck is a master planner and composer. Watching him on drums, you can follow his decision making of where to come in, what texture is appropriate, how does this fit contextually, etc. He improvises like a composer. Everything is very precise and controlled, while producing a wide array of moods and textures. Drew Gress has such a beautiful sound and improvises so thoughtfully. He always knows exactly where he needs to be in the ensemble's sound. It is no wonder that he has an extensive discography as a leader and sideman with many heavy hitters. During the masterclass at McGill, Matt Moran said he tends to avoid transcribing vibraphonists, and spends time learning solos from other instruments. He wants to avoid sounding like a vibraphonist, and this approach was apparent in the show. He used bows and toys to change the sound of the vibraphone, and played blistering lines up and down the entire instrument. I guarantee you have not heard the accordion played in the way Red Wierenga approaches the instrument. He finds so many twisted chord voicings and the way Hollenbeck writes for the ensemble caters to this ability. He also builds DIY analog synthesizers, electronically equipped pianos, and his own software creations in Max/MSP. Check out his website. Claudia Quintet feels like anything is possible, in both improvisation and composition. This freedom is so fresh and intriguing, appealing to listeners both intellectually and emotionally. Be sure to check out their latest record "Super Petite," which is an excellent example of the group's dynamic together. Thanks to L'OFF Festival de jazz de Montréal for putting on this incredible double bill with Thom Gossage's band. It was a memorable evening of creative music! Last summer, I had the pleasure of photographing the motorcycle of my friend and great bassist, Sébastien Pellerin. If you know me, you will know that I have an extreme passion for cars and motorcycles, in any shape or form. It is rare that this intersects with my music world, and this is one of those unique moments. I talked to Seb about this relationship between the world of motorcycles and music. When did you get the bike? How long have you had it? I got the bike in 2011, and it was stock (or of...). It was painted in grey, but nothing was modified. Looked at a ton of pictures, websites, videos, and I started picturing what my bike could look like. I found a guy, Jose Ortega, who modified the bike for me. What work has been done to the bike? What is the feeling of riding the bike? It's a fairly easy bike to ride, but unlike new bikes, you have to work with it. It's still a bit heavy, but the acceleration is great. It has lots of torque from the 650cc engine. The bike handles well and the sound is just perfect. Loud enough when you're twisting the throttle! 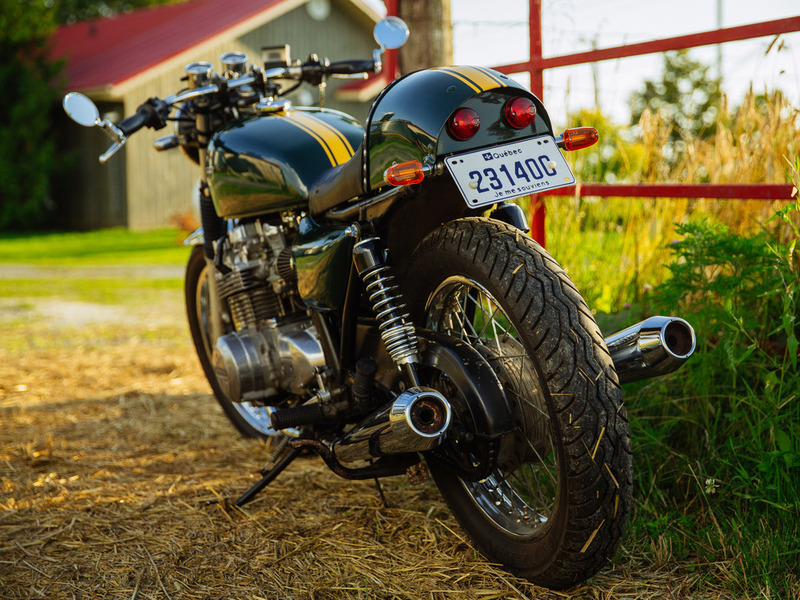 What made you want to get a motorcycle, especially a vintage bike? What drew you to the Kawasaki? I've been riding with my dad since I was about 8 years old. He had a big Honda Gold Wing and then a Harley. My mom told me that when I heard a bike passing in the street, I would stop everything and look at the bike until it was gone. I did lots of mountain biking, but I only started to ride motorbikes at 28. I made my decision because I didn't want to be behind my dad's bike anymore. So I looked on Kijiji, found a cheap bike for 800$ (it couldn't even start when we looked for it, but we gave it a try), got my driver's license for it, modified it during the winter of 2011/2012, and i've been riding with it since then. Vintage bikes are cheap. Insurance and plates are cheap. Parts can be a bit hard to find (especially for Kawasaki), but it's the best bike to start with. I think you really learn the ''hard'' way with a vintage bike. Do you ever relate riding to playing music? It sounds cliche, but I actually like riding because I don't think of anything else but the road. I could relate this to music too. If you think of something else while playing, that's it, you're in the ditch! I always try to find the best line when I'm taking a curve. I guess it's just like playing a bass line. You want to get from point A to point B as smoothly as possible. I'm always working on my riding technique, so as when I'm practicing or playing bass. Thinking about my position, my balance, shifting my weight, keeping my eyes active on every single details/drivers/holes in the street. I could say the same for music, but with my ears instead. After writing all of this, I guess i'm not just thinking about the road. Still, it puts my brain in a different place. Sometimes you get a call for a job that you never thought you would have the chance to do. Shooting the Sipu Muin was definitely one of those days. I felt the need to write something about this experience, and bring light to this amazing piece of machinery. I developed an interest in heavy machinery while growing up around the construction sites where my dad worked. Spending the day around this hovercraft made me feel like a kid again. The Sipu Muin is operated by the Canadian Coast Guard, and is based in Trois-Rivières, QC. This particular craft is primarily used for ice breaking and search and rescue along the St. Lawrence River, and can operate in situations many other conventional ships cannot. It is capable of breaking up three square miles of ice per hour, and can operate in -40 degree conditions. Four 23 litre diesel motors, producing a total of 2819kw (around 3780 hp) of power, are responsible for operating the propellors and creating the lift under the craft. Hovercrafts operate by blowing high pressure air underneath with lift fans, and the air is trapped by the skirt around the edge. This lift allows the craft to glide across the top of the water without any friction on the surface, unlike the hull of a conventional ship. The Sipu Muin has a top speed of 55 mph, and is extremely maneuvrable. Océan Group Inc. is a tugboat manufacturer and shipyard in Québec City. They were going to be doing repairs to the hovercraft for the Coast Guard, meaning it would have to be taken out of the water and placed into one of their dry docks. We were there to document the workers as they carried out the operation. Two cranes were brought in from Guay Inc. to lift the hovercraft onto the dock. The Océan and Guay teams worked together to complete this operation. The hovercraft was to be placed on a long, remote-controlled truck bed. 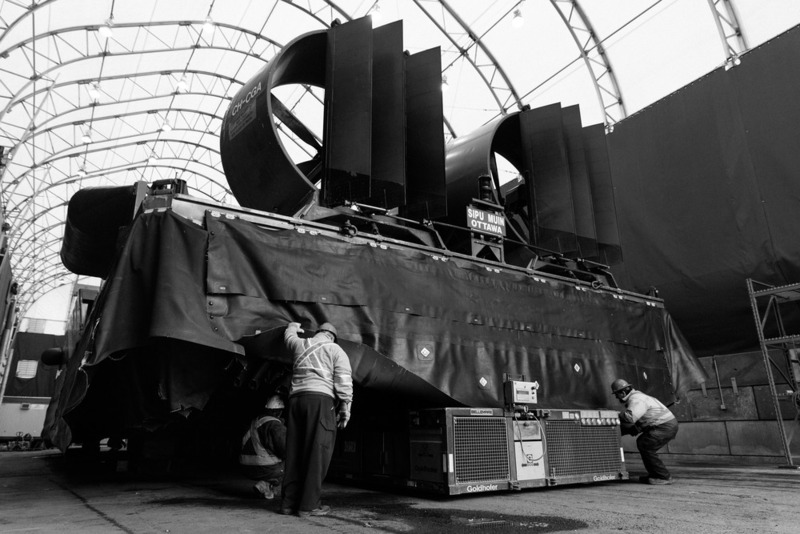 The workers placed two massive steel beams on the bed to be able to support the hovercraft. On this mid-May day, it was snowing and 34 degrees (1 degree celsius). I was dressed in four layers, along with full safety gear. Strong winds were blowing down the St. Lawrence. I was constantly having to wipe the drops off my lens from the snow. These conditions made for very dramatic scenes for photos. These workers were not phased, as I am sure this was nothing compared to the tough winters they are used to. As the Sipu Muin pulled up next to the dock, the workers began preparing the straps that would be used to lift the hovercraft from the water. As soon as it was latched up, it was go time. Once Sipu Muin was in place, I had the opportunity to go underneath the hovercraft while the crew was checking to make sure everything was in place properly. I never thought I would ever see the bottom of a hovercraft in my life, let alone be this close to one. For the penultimate step, the robot truck bed would have to maneuver this massive, heavy machine into the covered dry dock area. There was one man controlling the bed with a remote control, and it was quite the sight to witness. Once the craft was in place, the workers stacked wood blocks underneath the steel beams. The robotic truck bed then lowered with hydraulics in order to drop the Sipu Muin down onto wood blocks. I found it funny that after using all this big technology, the craft would be placed something as simple as wood. Finally, the bed began easing out from underneath the hovercraft, and the process was done. I am grateful to have had this opportunity to experience such a breathtaking piece of machinery. Big thanks to Kevin Gill Wilson at New Nation Creation for asking me to do the photography for this project. 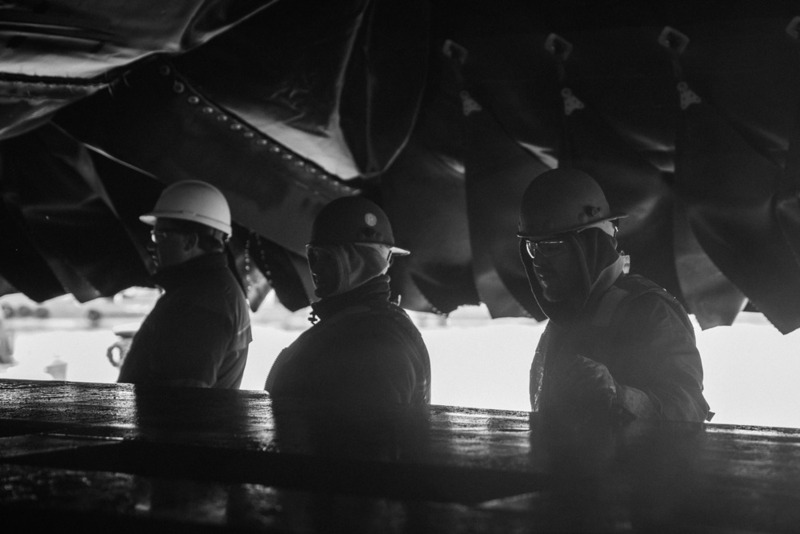 Watching the rugged teams work was inspiring as well, as it is so far from what I do for a living. If you want to learn more about hovercrafts, I would highly recommend this documentary. You can even see this hovercraft in action around the 41:30 mark.